We are located at 571 Farmington Avenue in the West End of Hartford, Connecticut. We are near such vital institutions as Hartford Seminary, the Mark Twain House, and the University of Connecticut School of Law. The office is located in our main church building at the corner of South Whitney Street. The office entrance is located up the stairs on the South Whitney side of the building, near our parking lot. The office is generally open Monday through Thursday from 9 a.m. until noon, although you might wish to call first at (860) 523-5132. The office email is staff@umcofhartford.org. The Pastor can be reached directly at pastor@umcofhartford.org. Our Sunday worship service begins at 10 a.m. We celebrate communion the first Sunday of the month. From September to May, our Sunday School is in session. Children, of course, are always welcome to be at the worship service with us. Handicapped access is available from the parking lot door. To reach us, take Farmington Avenue to South Whitney Street. Turn south on South Whitney. The church parking lot will be on your right just past the church building. From I-84, take the Sisson Avenue Exit. Go straight past the light until you come to a stop light at South Whitney. Turn right onto South Whitney. You will pass a stop sign. 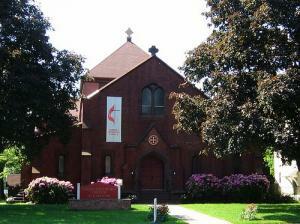 The church parking lot will be on your left as you approach Farmington Avenue.